I’S one of the most popular television dramas of the past decade, yet the star of 24 has never actually watched one single episode of it. 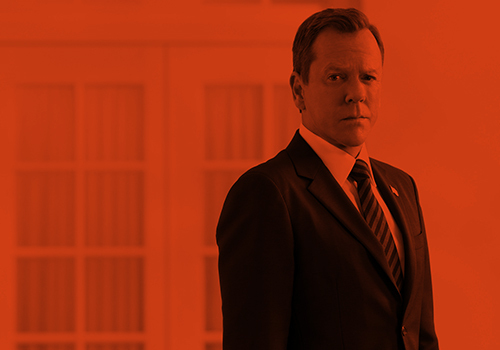 Kiefer Sutherland – who plays CTU agent Jack Bauer – has admitted to never sitting down and tuning in to the hit series because he fears he will “rip it apart”. Speaking during his appearance on ‘The Jonathan Ross Show’, the father-of-two revealed that the last film he watched of his was cult Eighties movie ‘Stand By Me’ which also stars River Phoenix and Corey Feldman. “I had a girlfriend at the time and we went to the cast and crew screening and I had a very specific idea of what I wanted to do with the character,” Kiefer explained. He continued: “It was really lucky for me because there was another film that I didn’t want to do that I took because of that, which was Lost Boys, so clearly I am not the person to watch my own work. The 47-year-old actor is currently filming the ninth series of ’24’ in the Capital, which he said isvery relevant to the show and it’s past success. “It’s a pleasure to come and do this twelve episode thing in London. Specifically because 24 actually came out in the States at the same time as it did in England and the response in England was immediate,” he explained. Although Jonathan was keen for Kiefer to give at least one tiny detail away about ’24: Live Another Day’, the actor was careful not to hand out any clues. The full interview with Kiefer Sutherland can be seen on ‘The Jonathan Ross Show’ on Saturday February 8 at 9.55pm on ITV1. This entry was posted by Courtney on Friday, February 7th, 2014 at 1:36 pm. It is filed under 24: Live Another Day, Interviews. You can follow any responses to this entry through the Comments Feed.